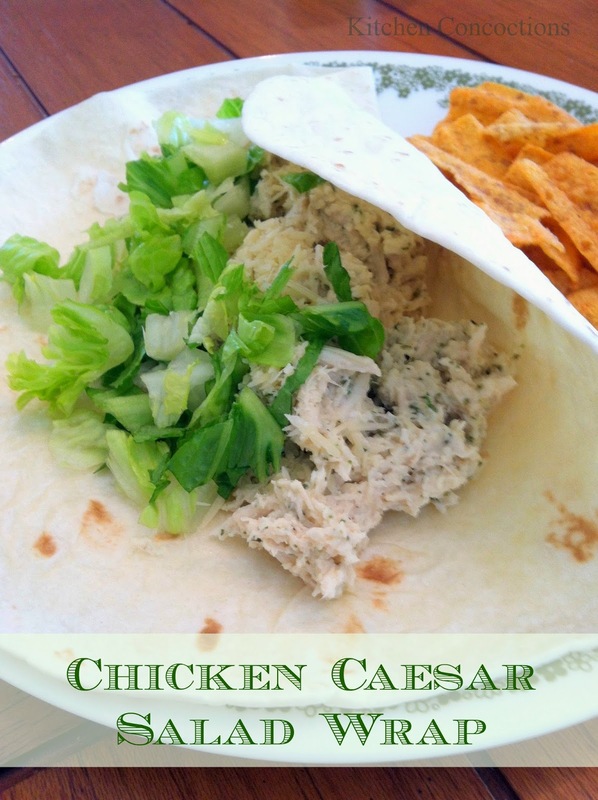 I saw a recipe for Caesar salad sandwiches, but I liked the idea of a wrap better. The first time I tried it was at my family reunion. We brought a bag of Garden Salsa Sun Chips to go along side the wraps but we found that the wraps were much better with the chips inside. The combination may sound odd, but they gave the wrap just the zing it needed! Enjoy! Boil the chicken with bouillon cubes, salt and garlic powder. Once the chicken is cooked, shred with forks or a food processor (if you are lucky enough to have one. If not you have to use the forks like me). Combine the shredded chicken, Caesar dressing, half of the Parmesan cheese, parsley and pepper in a pot on the stove. Over medium heat, cook for about 5-10 minutes, until the cheese has melted and everything is hot. Put the chicken mixture onto the tortilla shells and top with the other half of the Parmesan cheese, romaine, lemon juice and Garden Salsa Sun chips. Roll and enjoy!